The handbook of theory and practice in bank credit analysis and ratings, fully updated and revised The Bank Credit Analysis Handbook, Second Edition explains the role and methodologies of bank credit analysts, giving both investors and practitioners an insider's perspective on how rating agencies assign all-important credit ratings to banks. Updated for today's environment of increased oversight and calls for transparency, it includes international case studies of bank credit analysis; suggestions and insights for understanding and complying with the Basel Accords; techniques for reviewing asset quality on both quantitative and qualitative bases; studies of the restructuring of distressed banks, bank rating types and symbologies; and more. Charts, graphs, and spreadsheet illustrations help tie together the issues discussed throughout the text. JONATHAN GOLIN, a graduate of Berkeley and Harvard Law School, has more than fifteen years' experience in the financial sector. He worked at the Economist Intelligence Unit and as a credit analyst at Tokai Asia in Hong Kong before joining Thomson BankWatch Asia in 1997, a specialist rating agency. 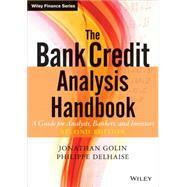 After BankWatch was absorbed by Fitch Ratings in 2000, Jonathan wrote the first edition of The Bank Credit Analysis Handbook (2002). Subsequently, he relocated to London and established his own bank credit research and training consultancy. Clients included Rabobank, Genworth Financial, Euromoney Training, the African Development Bank, and the Malaysia Deposit Insurance Corporation. More recently, Jonathan was employed by the UK's main bank regulator, the Financial Services Authority (FSA) as a risk specialist. Other books in which he had a lead role include Capital Flows Along the Mekong: The Complete Guide to Investing in Cambodia, Laos, Myanmar, and Vietnam (1995) and Covered Bonds beyond Pfandbriefe: Innovations, Investment and Structured Alternatives (2006). PHILIPPE DELHAISE, PhD, is the founder of Capital Information Services and the Carbon Management Consulting Group. He was the President of the Asia Division of Thomson BankWatch, and served as an adjunct professor of finance at City University of Hong Kong. Philippe Delhaise is a graduate of the University of Louvain (Belgium), with degrees in engineering, philosophy, and economics, and a graduate of the University of Chicago Booth School of Business. He is currently the President of CTRisks Rating, a licensed rating agency in Hong Kong. In 1998, Wiley published Delhaise's well-received book on the 1997 banking crisis in Asia: Asia in Crisis: The Implosion of the Banking and Finance Systems. An Introduction to Asset Quality: Non-Performing Loans and the Credit Cycle. Qualitative Review of Asset Quality. Quantitative Review of Asset Quality. Capital Adequacy: The Basel Accord and Proposed Changes. Funding and Liquidity, Part I: Liquidity and Asset-Liability Management. Funding and Liquidity, Part II: Funding the Bank and Ratio Analysis. Management and the Bank Visit. The Risk Management Context: The Practical Application of Credit Assessments. The Banking Environment: Sovereign Risk, Systemic Concerns and Approaches to Government Regulation. The Regulatory Regime: The Contours of Prudential Regulation of Banks. The Distressed Bank, Part II: Aims and Methods of Restructuring. The Distressed Bank, Part III: Recapitalization. The Distressed Bank, Part IV: Illustrative Approaches to Restructuring—Malaysia and South Korea. The Distressed Bank, Part V: Illustrative Approaches to Restructuring—Indonesia and Thailand. Rating the Bank, Part I: The Ratings Industry and its Rationale. Bank Rating Types and Symbologies: A User's Guide. Fixed Income Analysis Applied to Financial Institutions. E-Banking: The Internet and the Future of the Bank. Appendix A: Sources and Further Reading. Appendix B: Bank Analysis Toolbox — Ratio Compendium. Appendix C: The New Basel Capital Accord: The January 2001 Proposal Due for Implementation by 2004.